Kelatogen Astringent & Antiseptic Ointment is for the topical treatment and healing of wounds and persistent capilliary bleeding conditions only in dogs, cats and horses, where it is of a persistent and chronic nature such as ulcers. 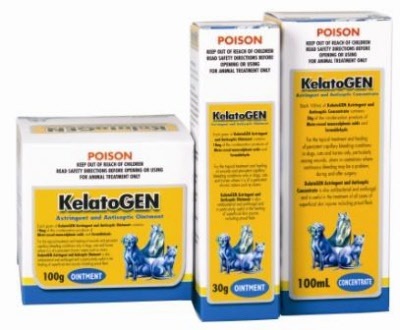 Kelatogen is also antibacterial and antifungal and is particularly useful in the healing of superficial skin injuries including proud flesh. In case of slow wound healing as with ulcers or the excessive capillary bleeding of old and new wounds, apply Kelatogen Astringent and Antiseptic ointment directly onto the wound twice daily until bleeding stops, then once daily until the wound completely heals. Each gram of Kelatogen contains 18mg of the condensation products of Meta-cresol monosulphonic acids and formaldehyde.